Now this is one of the old houses in old east downtown Davis. 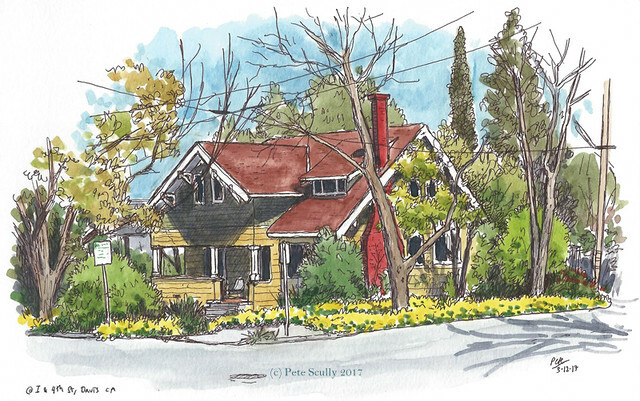 It is opposite the Schmeiser House, which you may recall I sketched on New Year’s Eve (see that here). In fact back when I sketched that I had half intended to sketch the whole panorama, but didn’t. So I went back last month and sketched the other half, but this time with a much more spring-like feeling. Those yellow flowers though! 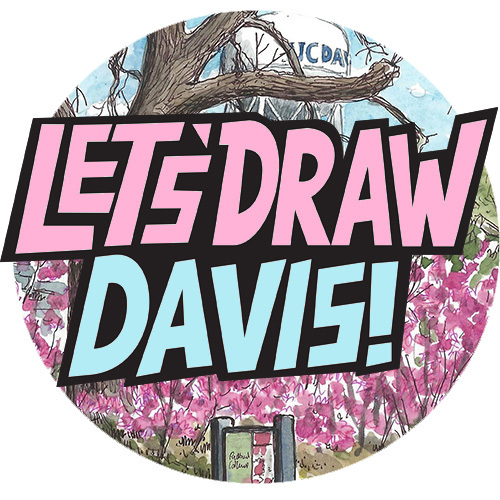 I must say though, the colours in the sketch started to look a bit odd after a while because, to be honest, I was finding it hard to see – my eyes were itching and watering, and I was sneezing, because yes, it’s allergies season, and Davis is notorious for the allergies. Even looking at this sketch makes me want to sneeze! I do like the old east downtown neighbourhood. I don’t like sneezing. I know the feeling — I’ve been sneezing my head off, and my nose is always itchy. Beautiful sketch, though, so the sneezing was worth it!